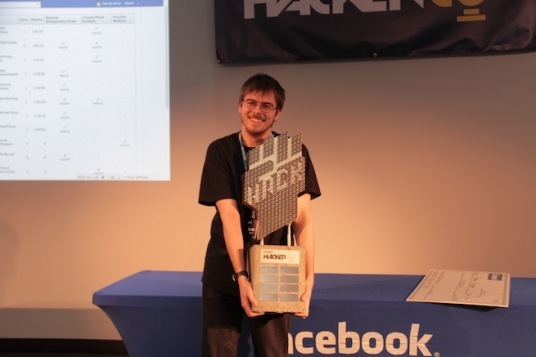 25 of the world’s best hackers gathered for Facebook’s 2nd annual Hacker Cup event being held at its offices in Menlo Park. Roman Andreev from Russia completed one problem correctly in 1 hr 4 min and won Facebook’s Hacker Cup to get his name placed on an awesome and really heavy cement trophy along with a check for $5000. The registration for the event opened in January and started off with three online rounds of problem solving. Out of 6,000 (8,000 submissions total) qualifying submissions, the group has been shrunken down to just 25 and flown to Facebook for the finals.The top coders, all male from around the world, are a mix of students, independent coders, and professionals. Facebook paid their way to California, including a stipend for obtaining a Visa, since only one of the participants is from the United States. The rest of the finalists are from Russia, Germany, Ukraine, Poland, China, South Korea, Taiwan, and Japan. The participants get challenged with three problems to solve in 3 hours, whoever finishes first win. Company says its An annual algorithmic programming contest open to engineers from around the world. Along with the title of “world champion” as the top hacker, the first prize is $5 000, second prize is $2 000, $1 000 for third, and $100 for everyone else.